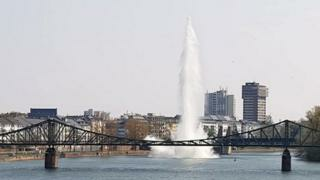 A World War Two-era US bomb has been detonated in a river in Frankfurt, causing water to spurt high into the air, German media report. Some 600 people were evacuated from parts of the city as bomb disposal experts got to work at about 08:00 local time (06:00 GMT) on Sunday. Following the explosion, divers were sent to check that the device was safe. The bomb was discovered on Tuesday in Frankfurt’s River Main, German news agency dpa reports. Divers with the city’s fire service were participating in a routine training exercise when they found the 250kg (550lb) device. Last year, German police defused a World War Two bomb in central Berlin, after some 10,000 people were evacuated.